This trip starts at the Umukarikari carpark, off Kaimanawa Rd, with the normal tramp across Unukarikari to Waipakihi Hut. The first night can be spent at the hut. On day two, locate the two blue poles on the other side of the Waipakihi at the point where you ford the stream just below the hut. There is a bit of a gap after the two poles but if you look up the hill you will see there are more poles up the hill and a large orange triangle marking the spot where the track enters the bush. This is an old hunter’s track that has recently been marked by DOC. Continue to bush line and then follow blue poles until you are at the top of the ridge. From here the marked track finishes but it is simply a matter of following the ridge. After a couple of kms the ridge climbs steeply again for 200m to reach the rounded summit of peak 1660. If coming in the other direction there are a few cairns to help you find the correct ridge. You are on the crest of the Middle Range which bisects the park from North to South. We will now descend slightly and then climb another 100m to the top of Thunderbolt. Despite its spectacular name, Thunderbolt is really only another bump on the ridge. It is also the junction point if going to the Rangitikei River. If doing this then you descend south to a low saddle before climbing to point 1656 to the south before heading into the Rangitikei. However we will head west and follow the ridge. This provides easy pleasant tramping towards the Waipakihi. The trip from Waipakihi Hut all the way to the valley again would be a long day. 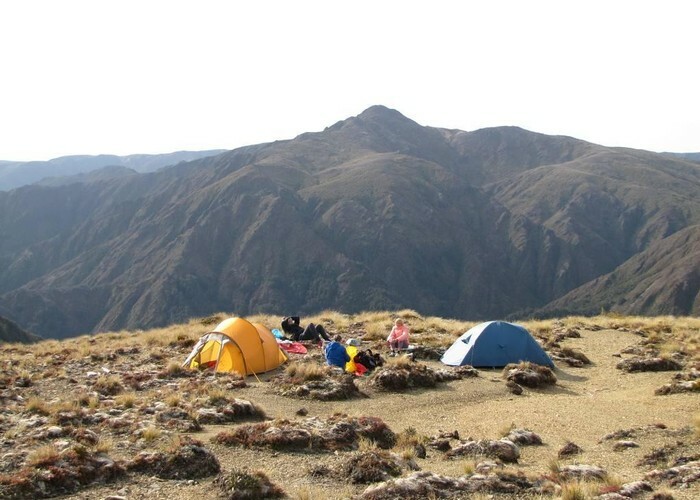 It is probable that you may prefer to camp along the ridge. I can’t recommend any particular place as this will depend on conditions. It will be difficult to find shelter from the wind and, once off the ridge top, it may be difficult to find a flat place to pitch a tent. However water is never far away. There are a couple of little hanging valleys between 1660 and Thunderbolt and another south of the western end of Thunderbolt ridge. These will certainly have reliable water and also possibly shelter from whatever wind prevails at the time. After about 3 hours from Thunderbolt you arrive at the top of Motutere. This marks the end of the ridge and the Waipakihi River is seen far below. Follow down a steep slope to the next knob and then pick up cairns which veer sharply to the right and onto a bush covered side ridge that extends parallel to the river to the north. Cairns and a good pad lead you through scrub to where the track enters the bush at a tree plastered in white permolats. The track descends steeply down the ridge and then veers off it directly down to the river below. It exits the bush and you immediately cross the river. The track is well marked with a new DOC sign. About half an hour downstream and, after 5 river crossings, you come to the sign marking where the track leaves the valley to cross via the Urchin trig. It is 3 hours from here to the Urchin carpark. Added 29 October 2010 by pmckepmcke. 3 revisions, most recently 31 October 2010 by pmckepmcke. 813 views in the past year (68 per month).